Athletic physical injuries are addressed, plus we also look at the fact that the joints, muscles and ligaments share certain nerve centers within particular organs and irritation in an organ can cause a problem in the joint. The inverse also applies – a problem in a joint can set off a problem in an associated organ. Treating either component will bring about health – treating both aspects ensures optimal well-being. Causes of problems: Our insides are neatly contained within an envelope called our skin, which works as a defense against outer aggressions. Our skin protects our life. Physical trauma is a destructive action that weakens us. Wounds heal but the body retains memories of scars, pain and stress. Psychological trauma creates another breach of our defenses, no superficial scar tissue results, but the memory imprints itself deep inside the body. This weak link will show up in our most sensitive spot or vulnerable organ. Solutions: Through application of referred listening skills, finding weaknesses – areas lacking responses or over responding, and applying corrective activity skills to realign structural integration on bones, joints, muscles, groups of muscles, blood vessels, organs, and nerves results in optimal health and fitness. 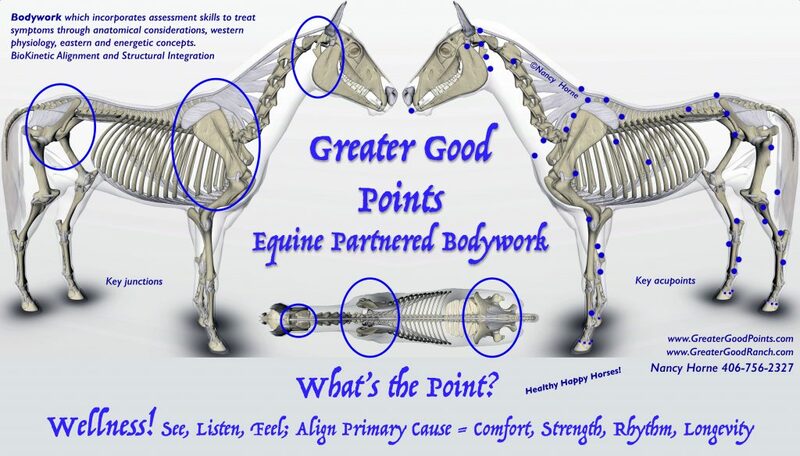 Nancy provides sessions on horses and dogs with techniques that include assessment skills, Manual therapy, Tucker BioKinetic Body Checkups and Tucker BioKinetic Alignment, Masterson Method® – Integrated Equine Performance Bodywork. Additional modalities practiced also include Acupressure, Physical and Energy Healing, Red Light, Cold Laser, BEMER therapy, Equine Massage and Essential Oils. Nancy also specifically teaches pre-work for owners, handlers to better their awareness, intent and connection.